The Indian national carrier, which recently restarted flights to Moscow, is also in talks with Air Astana to expand flights to Kazakhstan. S7 Airlines has initiated talks for a code sharing agreement with India’s national carrier Air India, Mint reported on its website. “They are the IndiGo of Russia and even though they are not with Star Alliance we are hopeful of getting an exception from Star for having a code share with S7,” an Air India official told the paper. Air India operates 4 flights a week from Delhi to Moscow’s Domodedovo Airport and an agreement with S7 would help the airline offer tickets from Indian cities to a wide range of destinations in Russia. 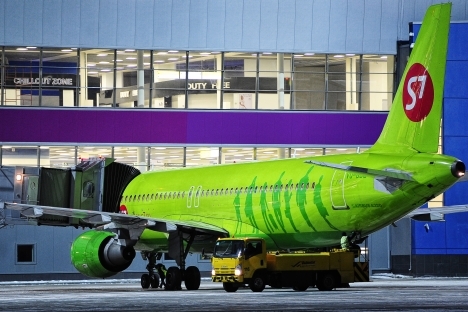 The Russian airline is based in Novosibirsk, which along with Domodedovo, form its major hubs. At the moment, S7 offers tickets to Indian cities on account of its code sharing agreement with Cathay Pacific, under which visitors from the Russian Far East fly to India via Hong Kong. A tie up with Air India would help the airline offer tickets to several new destinations in a country that is likely to see a large rise in Russian visitors once an e-visa system is introduced. Currently India and Russia are connected by 11 weekly flights, all between Delhi and Moscow. It has been a long standing demand of the Indian business community to restart the Mumbai-Moscow Aeroflot service. Travellers from Mumbai usually fly to Moscow via Abu Dhabi, Dubai or Doha. Under the existing India-Russia air services agreement signed in 2006, designated carriers from both countries are allowed to operate 46 flights a week in both directions. Russian airlines use this capacity in the tourist season for chartered flights to Goa and Kerala. India’s low-cost carriers have been seeking an entry to the Russian market and using Moscow as a base for flights to other cities in the Commonwealth of Independent States.